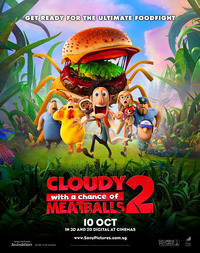 Cloudy with a Chance of Meatballs 2 picks up where the action of its predecessor left off. At the end of Cloudy with a Chance of Meatballs (2009), Flint Lockwood (Bill Hader) has saved his hometown (on a small island) from being destroyed by giant food that rains from the sky - a situation caused in the first place by his scientific inventiveness. In the course of doing so he has finally connected with and made proud his father, and shaken off his attachment to a manipulative would-be father (the town mayor). He also forms an allegiance and a friendship with a bully from his school days, and earns the affections of Sam Sparks (Anna Faris), a weather reporter and fellow scientist. As we might expect from a sequel, we get a combination of repetition and variation. Flint and company temporarily leave the island for a more metropolitan setting, but soon return. When they do, they face not giant food but animal-food hybrids. I will not spoil the inventive hybridity of both the creatures’ appearances and their names. Another backbone of the earlier film that it repeats is that Flint is once again manipulated by an older and more powerful male - this time, a somewhat bland technological guru figure who heads what appears to be a rather toothless satire of the Apple Corporation. Some animated franchises have successfully told a series of stories about an ensemble of characters. Disney•Pixar’s Toy Story (1995) and Dreamworks’s Shrek (2001) are probably the best (and best-known) examples of this. Unfortunately, this is not a stroke that Cloudy with a Chance of Meatballs 2 really pulls off. In the first film, Flint is at the the intersection of a series of individual trajectories. He quests, and as part of his quest, his relationships with other characters are transformed. What makes the sequel so much less satisfying is that the other characters are not given new and equally satisfying trajectories and functions. Instead, we get what feels like Flint and his chorus. Visually, the film is as impressive as one now expects big-screen animation to be. Charm and humour, however, are much thinner on the ground. It is possible to argue that the final instalments of the Shrek and the Toy Story series are the best and most satisfying of all. If Sony/Columbia want this to be said of their series, and if there is going to be a Meatballs 3, they had better do better than this. This review was published on November 11, 2013.